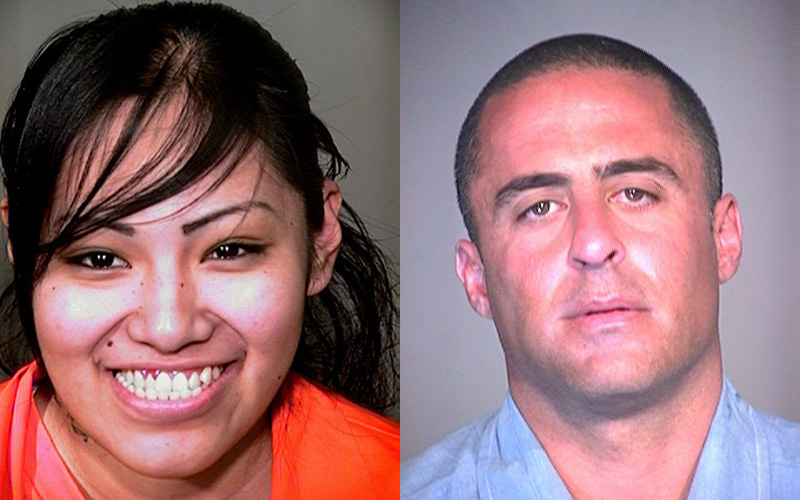 Department of Corrections employees lied about conducting security rounds and falsified records involving the suicides of two Arizona inmates – one of whom died during a nearly three-hour time period when prison video shows no regular or required checks were done at all, according to a Cronkite News review of DOC documents. The DOC records include hundreds of pages of internal records that document the DOC’s investigation of employee conduct involving the suicides of Cynthia Apkaw, an inmate in Perryville Prison, in August 2015 and Scott Saba, an inmate in Florence Prison, in February 2016. In both cases, DOC employees unsuccessfully attempted life-saving measures when they found the prisoners hanging in their cells. In the case of Apkaw, employee activity logs showed all required security and welfare checks were completed and officers observed the inmates alive and well every half hour, the records show. But video released by the DOC shows the logs were falsified, with no officers conducting the required checks on prisoners between the last check and when an officer found Apkaw hanging by a bedsheet in her cell, where she was alone. “The journal documents security checks had been completed every 30 minutes with the last security check allegedly done at 1830 hours before I/M Apkaw was found hanging in her cell,” it continues. Apkaw was 25 and serving a 10-year sentence at the Perryville prison for aggravated assault. In the case of Saba, reports show the officer who found Saba’s body had to run to get help because she already had turned in her radio and keys before the end of her shift. Even after help was called, it took officers about five minutes to gain entry to the cell because Saba’s body blocked them from opening it, according to the reports. Saba, 45, was serving over 20 years for a slew of charges including drug violations, organized retail theft and identity theft. Thirteen employees have been fired and eight more disciplined for various protocol violations and neglect of duties. “Our investigations uncovered troubling instances of neglect of duty and other serious misconduct by some employees which, as a public safety agency, we cannot and will not tolerate,” DOC Director Charles Ryan said in a written statement sent by spokesperson Andrew Wilder. The firings come more than a year after a settlement was reached in the class-action lawsuit Parsons v. Ryan over the treatment of Arizona’s state prisoners, in which the Civil Liberties Union of Arizona sued the department over lack of proper health care for the over 33,000 prisoners. The lawsuit was filed in March 2012. The settlement said the Department of Corrections must fix their health care system, a system that the ACLU says is plagued with long-term issues. “The Parsons vs. Ryan lawsuit was filed in 2012 and it is a class-action lawsuit on behalf of all of the prisoners in Arizona-run prison facilities related to their health care and solitary confinement practices. We contend that the prisoners are not receiving physical and mental health care that is constitutionally adequate,” ACLU spokesman Steve Kilar said. On April 11, a few days before the announcement of the firings, the ACLU filed a complaint on the settlement to “enforce the terms of the Stipulation and order Defendants to take immediate and substantial action to remedy gross and dangerous deficiencies within their health care system that continue to prevent the provision of adequate health care and place class members at grave danger of serious harm or death,” court records show. The original settlement requires prisons to meet over 100 health care standards ranging from mental health to dentistry and care of pregnant prisoners. Kilar said the recent suicides and lack of proper attention is not surprising, citing a lack of staff and physical and mental health professionals, along with high rates of keeping inmates in isolation, as causes for preventable deaths and injuries in the Arizona prison system. A Cronkite News report from last month found that there were nearly 500 incidents of attempted self-harm or suicide in Arizona prisons in 2015 resulting in six deaths. Kilar said the ACLU has been working for years to improve prison health care in Arizona, including bringing in medical experts from around the country. “We know from years of litigation and having experts, medical experts, go into these facilities that these are the result of systemic problems, understaffing, poor training. So we weren’t surprised by it and we really have been hoping that this is a wake up call, the firing of these officers is a wake up call, for the people of Arizona to realize that we are not treating the people in our care, prisoners or not, we’re not treating them humanely,” Kilar said.